Pulse rolls, ½ cup broth, ¼ cup sour cream, egg yolks, and anchovies in food processor until well combined, about 10 pulses. Add meatloaf mix, onion, 1 tablespoon capers, 1 tablespoon parsley, 1 ½ teaspoons pepper, ½ teaspoon salt, ½ teaspoon allspice, and nutmeg and process until well combined, about 30 seconds. Transfer mixture to bowl, divide into twelve ½ cup portions, and form into meatballs with your wet hands. Meat butter in Dutch oven over medium heat. Whisk in flour and remaining ½ teaspoon allspice and cook for 1 minute. Slowly whisk in water remaining 3 ½ cups broth until incorporated. Add bay leaf and thyme sprig and bring to simmer. Add meatballs and return to simmer. 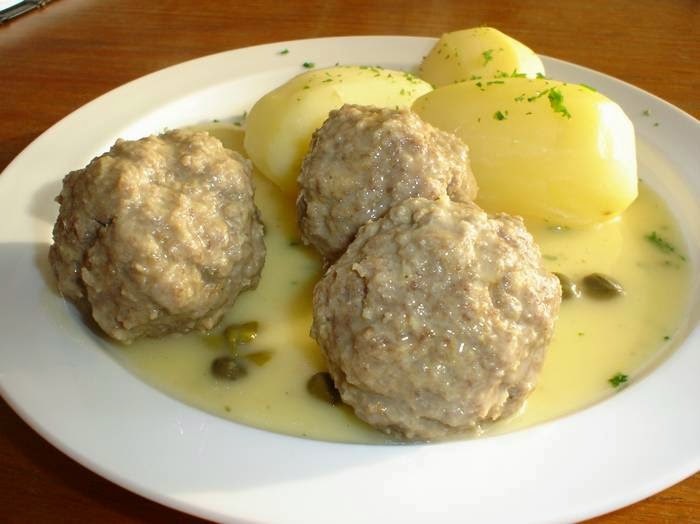 Reduce heat to low cover, and cook until meatballs register 160 degrees, 20 to 25 minutes. Using slotted spoon, transfer meatballs to a large, shallow casserole dish and tent lossely with aluminum foil. While meatballs rest, bring sauce to boil over medium high heat and cook until thickened and measures about 4 cups, 10 to 15 minutes. Off heat, whisk in Worcestershire, lemon zest, remaining ¾ cup sour cream, and ramining 2 tablespoons capers. Season whit salt and pepper to taste. Discard bay leaf and thyme sprig. Pour sauce over meatballs and sprinkle with remaining 2 tablespoons parsley. Serve.